The Baltimore Colts were one of the first NFL teams to have cheerleaders, a marching band and a team “fight song” (along with the nearby Washington Redskins, forty miles southwest in the nation’s capital). The Baltimore Colts were named after Baltimore’s 142-year-old annual “Preakness Stakes”, a premier thoroughbred horse racing event, second jewel of the famous “Triple Crown” championship series of the sport run at the historic Pimlico Race Course since 1873. Our Day 16 offers some really fun gift ideas for the COLTS FAN in your life (or maybe, just maybe, that’s you!). 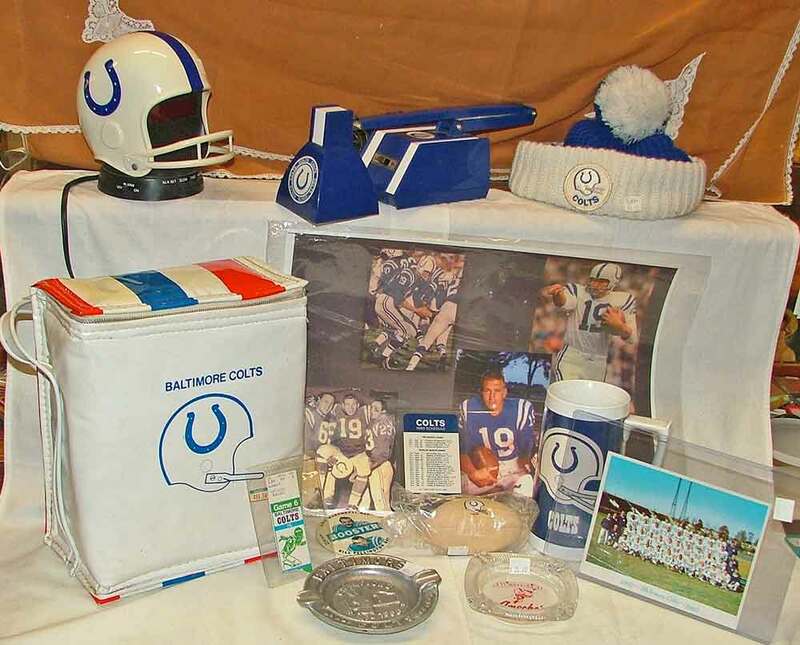 Some of the items we have include a helmet clock, desk lamp, knit hat, 2-thermos and insulated bag, Johnny Unitas signed photo, 1982 ticket stub, booster pin, 1980 schedule, Colts mug, NFL Champions 1958 pewter ‘First Sudden Death Play-Off’ ashtray, Ameche’s ash tray w/Colts logo. Enjoy this great video about Johnny Unitas! ENJOY… then come visit us at Bahoukas Antique Mall and find the perfect gift for the holidays. Yep, we’ll be watchin’ for ya!